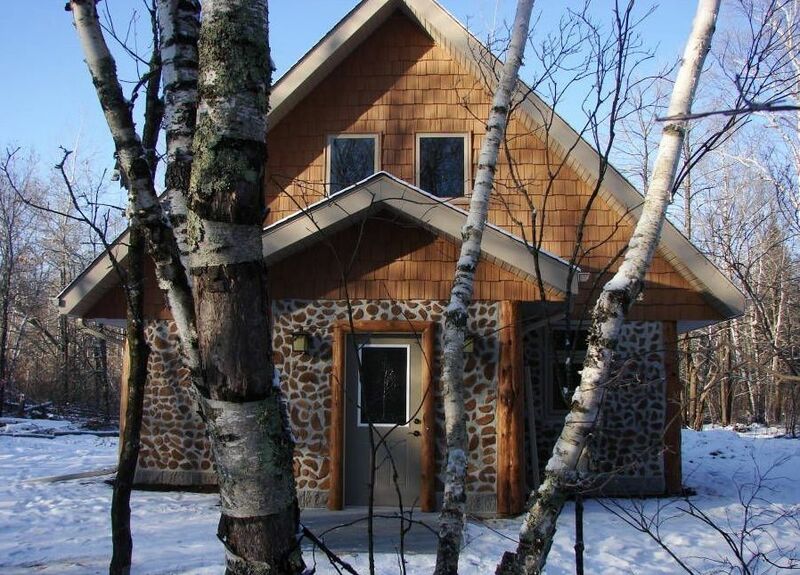 Cordwood Home on the White Earth Reservation in Minnesota. 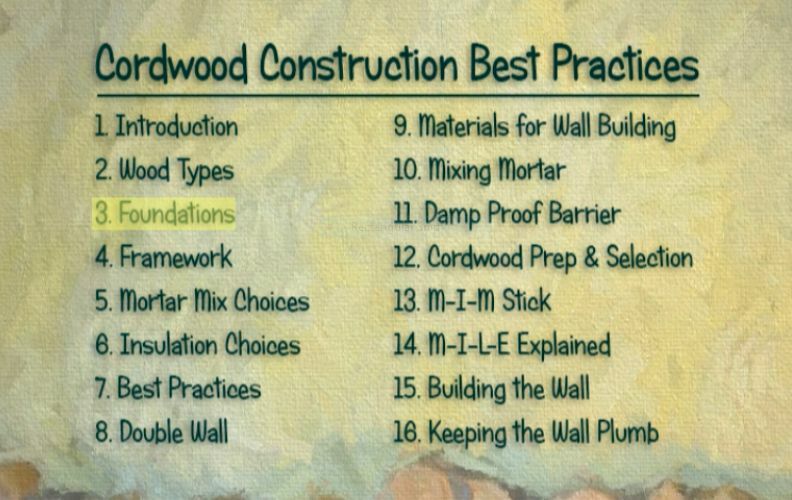 The MMCDC (Midwest Minnesota Community Development Corporation) contacted us with regard to the possibility of building a cordwood home on the White Earth Reservation in NW Minnesota. The idea was to provide attractive, affordable, energy efficient housing on the reservation, while offering employment opportunities for the training of tribal cordwood masons. 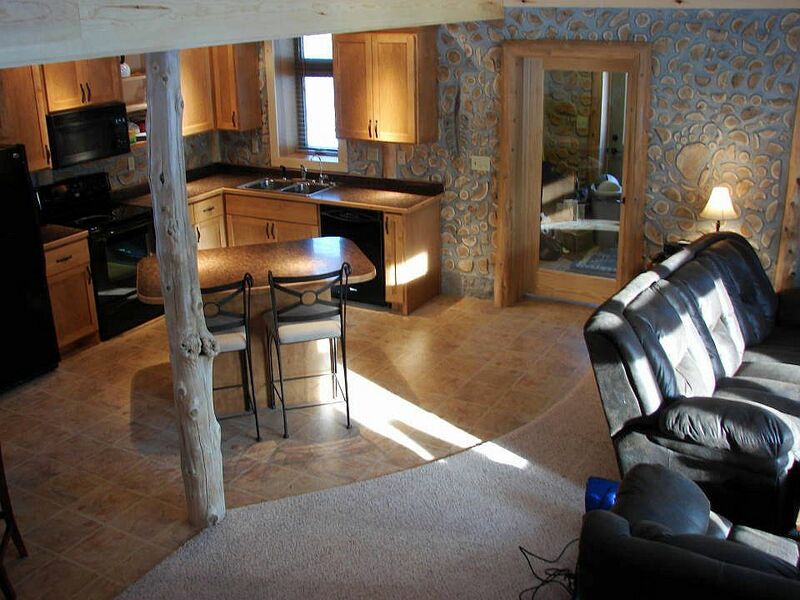 The plan to work with the White Earth Tribal Land Office allowed the home to be constructed on Tribal Trust Land. The local contractor and members of the tribe were enthusiastic about building a home that would be in harmony with the natural surroundings, be energy efficient and use locally available resources. It would be designed and built with wood from the area and in accord with Ojibwa home traditions. That is, the house would be a multi-generational home, it would incorporate a large family gathering area, the entrance would face east, and it would be comprised mostly of renewable materials. 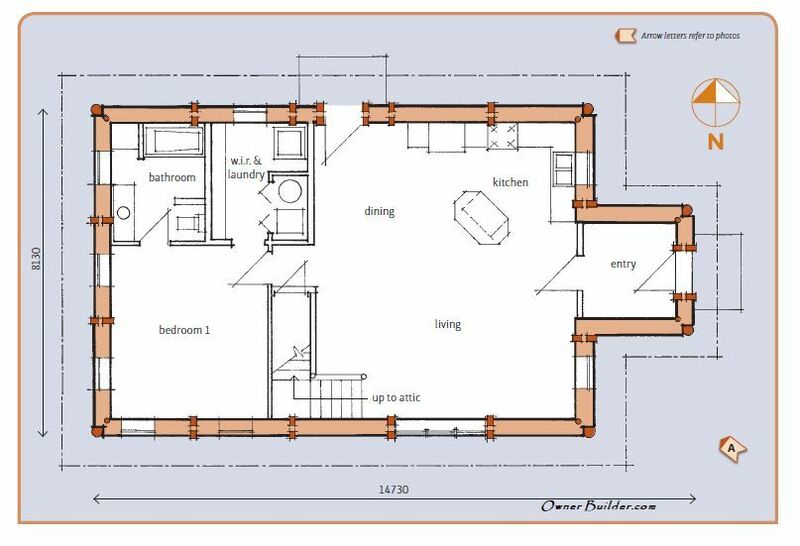 Floor plan for 1840 sq. ft. home (1,040 sq. ft. first floor, 800 sq. ft. second floor). 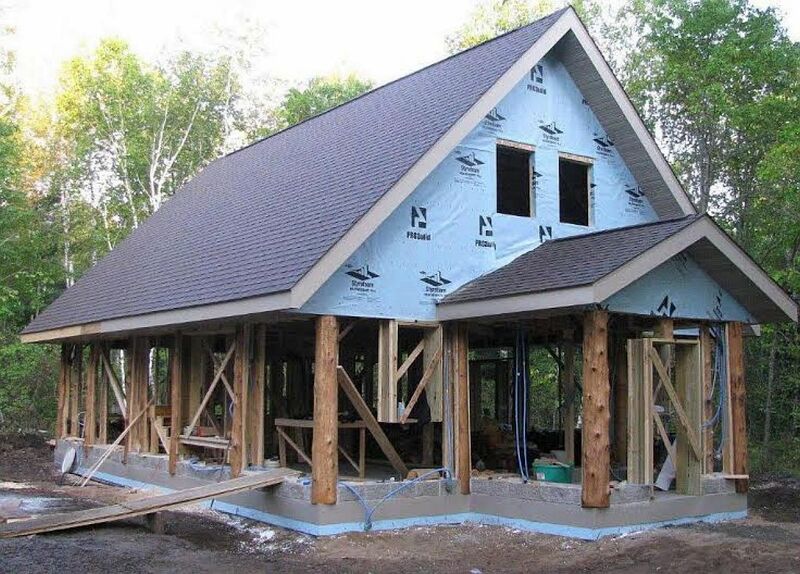 Here are the processes and attributes of this very successful home building project. 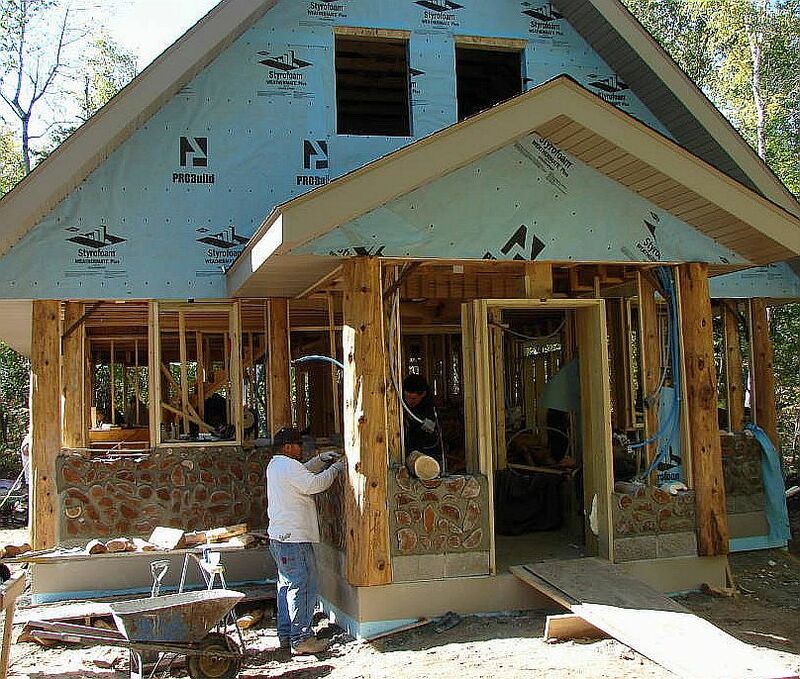 We were fortunate to work with two very capable builders: Robert Zahorski, the general contractor and Bill Paulson, a tribal member who was the project coordinator. Each dovetailed into the other’s strengths and the result was a building that evokes Ojibwa traditions, built with 21st century construction techniques. In the fall of 2009 the foundation was built with an insulated sand bed, beneath an insulated cement slab. This sand bed will store heat during off-peak energy hours and then radiate it throughout the house during the high-energy-rate use daylight hours. 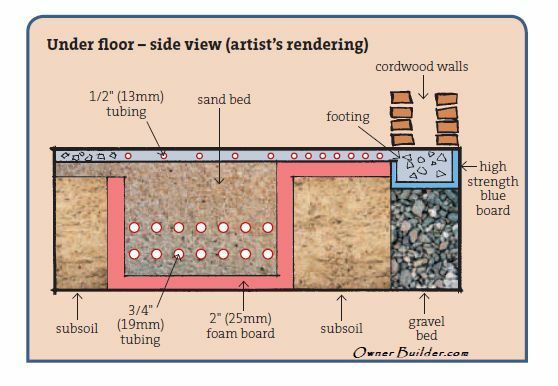 This is similar to radiant-in-floor heat, except the large sand bed under the foundation is insulated and provides heat energy storage for the home. The drawing on the left, courtesy of Alan Stankevitz of daycreek.com, gives a rendering of this concept. The post and beam framework was erected by a local contractor. Cedar posts gathered from near the reservation were milled on the two sides that would abut the cordwood infill. They were left rounded on the interior and exterior. The cedar post and beam framework was braced. The bracing is very important to maintain structural integrity and prevent sections from going “out of square.” The braces are only removed after the cordwood walls approach the four foot mark. As you will notice, the roof is complete and shingled. Having the roof finished before cordwood construction begins means that the cordwood mortaring can take place, for the most part, out of the elements. If a section is not finished in time, it can be ‘boarded up’ for the winter and work can continue on the inside of the building. Attaching tarps to the fascia boards is helpful when it is necessary to protect the mortar and the workers from the drying rays of the sun. 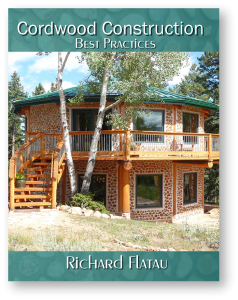 There are many code compliant ways to run electrical wiring in a cordwood building. In general for wiring jobs we recommend that you follow your local building codes. 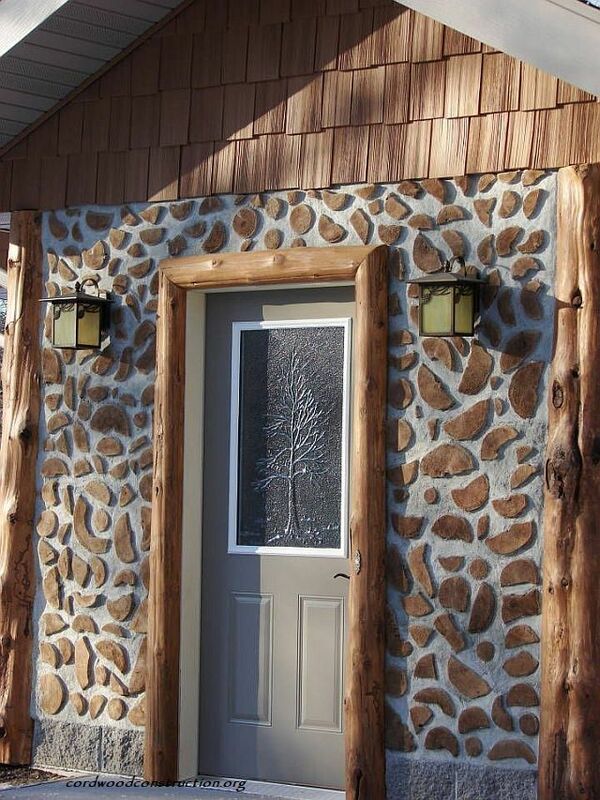 In cordwood buildings in various parts of the country, we have used conduit, Romex NM, and UL 12-2 wiring (with a resistant coated jacket) wire-stapled to the middle of the posts. In this particular instance the electrical contractor chose to run flexible, plastic tubes (also called flexible PVC conduit). In accord with the blueprint, the ‘blue smurf’ wiring tubes were then installed throughout the building. The hanging blue tubes (with metal receptacles) were very irritating to work around during construction. The masons were constantly bumping into them while mortaring. The window boxes (made of double 2″ x 8″s) were hung, using the sturdy top plates as fastening points. The two exterior door frames were ‘roughed in.’ Later these would have doors with beautiful etched glass panels installed for both privacy and beauty (see picture at end of article). The window boxes, door framing and wiring tubes are shown in the phot0. Notice that the window boxes are screwed into the top plate of the post and beam framework. This helps to assure that the windows will always open. 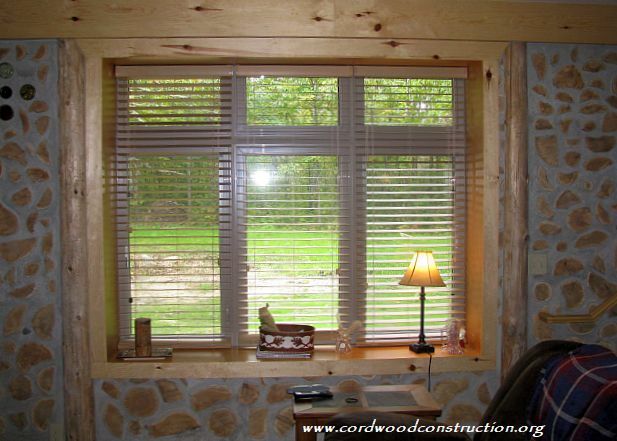 Early in the process, the decision was made to use 16″ cedar log ends for the cordwood infill. This length would provide an insulation value of R-24. The logs had been cut and dried for four years in eight foot lengths. After that they were cut into 16″ lengths and 70% of the logs were split to assure faster drying. On the way to being stacked the logs were dipped in a borate solution (four cups of borax to one gallon of water). Finally, the logs were stacked in single rows for drying. While stacked, the exterior ends of the log ends were brushed with a UV blocker (Lifeline Exterior from Permachink) so that the faces of the exterior log ends would maintain their color. The interior log end faces were left natural. A mortar mixer was purchased and three different individuals were trained on mixing proper cordwood “mud.” It was very helpful to have an alternate “mortar mixer” when someone had a scheduling conflict. The overall feel of the mortar is an adobe style texture which is easily tuck-pointed with a spoon. For insulation, the initial strategy was to use regular coarse softwood sawdust mixed with hydrated lime in the center cavity, but a dearth of coarse, softwood sawdust in the area, led to another decision. It was determined that injected closed cell foam was going to be used. The main advantages of injected foam are: high R-value (R-7 per inch), it bonds well with the wood and tends to fill every nook and cranny. 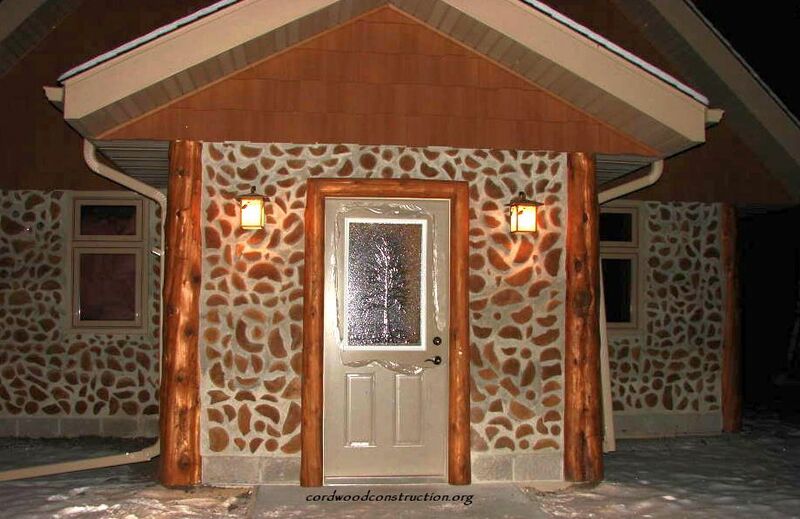 Cordwood builder Sandy Clidaras of Quebec has been a pioneer in using closed cell foam in single wall cordwood and so we consulted him for advice. Sandy generously gave of his time and information. Convinced of the foam’s merits, we ordered eight kits of foam insulation. 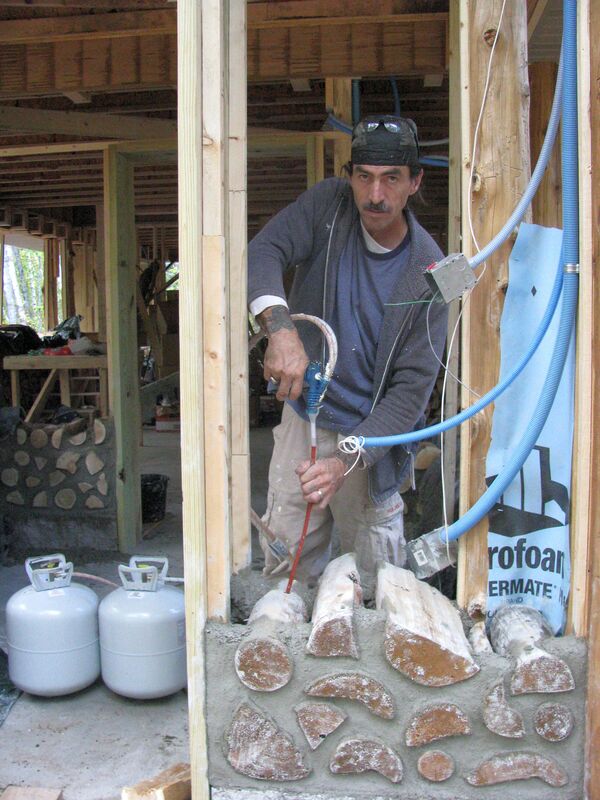 When using injected closed cell foam the cordwood wall is first built in two-foot-high sections. Half-inch tubes are inserted in the center cavity as the wall is being built. The mortar is left to harden for at least 24 hours (any sooner and the wall may be lifted by the pressure of the expanding foam). The foam is then injected into the tubes. The foam comes in two canisters, which must be warmed before being used and then shaken while injecting (this makes certain all the foam is used). There are many companies that make expanding foam and quite a number of building supply stores carry the kits. To find a foam retailer, do a Google search and make a few phone calls to get your best price. 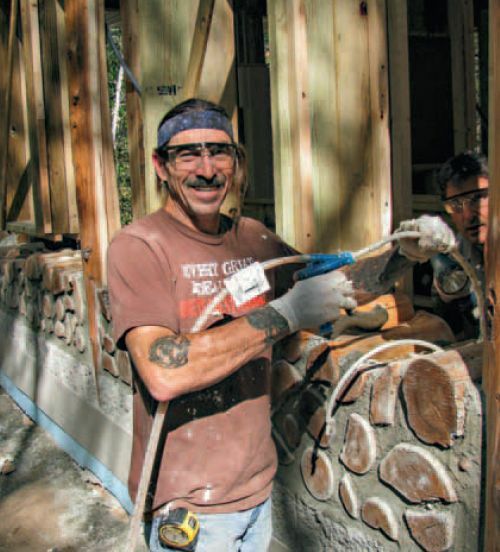 On a 1,200 square foot home, with eight foot high cordwood walls, the foam will add approximately $4000 to the cost of construction. The closed cell foam is rated at an R-value of 7 per inch. A 5 inch cavity gives an R-value of 35. 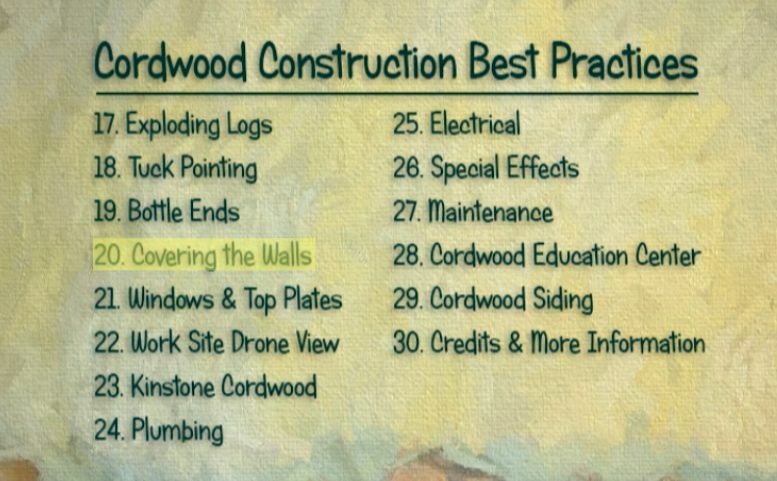 Coupled with the usual 16″ cordwood walls’ R-value of R-24, we extrapolated that our wall R-value approached R-30. When we left to conduct another workshop in North Carolina the cordwood mortaring crew was about one third finished. Little did we know at the time that the fall of 2009 in northwestern Minnesota would turn into one of the coldest on record. Finishing the cordwood infill in October meant tarping the house, covering the cordwood walls with blankets and ‘firing-up’ a propane heater. Starting a little later in the morning allowed the temperatures rise a bit. If at all possible, cold weather mortaring is something to avoid. If the water in the mortar mix freezes it can cause the mortar to flake and crumble. Since this home was built within a post and beam framework there was no worry about structural integrity, but to have to re-mortar a complete wall or part of a wall would become a very labor intensive operation, especially since the mortar flaking may not be immediately apparent. The freshly mortared cordwood wall must be covered with blankets or tarps and secured, so it is protected from freezing cold and wind. Even though there is a little heat generated from the chemical reaction of the Portland cement and the water, it is not enough to prevent it from freezing when the temperatures plummet. On this project, not only did we tarp the entire house, but we placed a propane heater in the middle of the house to keep the mortar from freezing. It is very important to keep the walls covered, except when mortaring, for at least seven days. According to masonry experts, masonry mortar takes seven days to dry and fourteen days to cure. There are ingredients that can be added to the mortar mix to retard freezing (calcium chloride), but with the soaked sawdust in this mix, no one can adequately be certain that these non-freeze agents will work properly. So it is best to cover, seal and provide a source of heat if the temperature is going into the 20’s. Diminishing the amount of sawdust as temperatures drop can be helpful, as the retarding feature of the sawdust is less important.On this project we were properly prepared to prevent the masonry from freezing during the very cold month of October. While the precautions kept the cordwood walls from freezing, it added to labor costs by requiring time consuming ‘take-down’ every morning and ‘button-up’ in the evening. 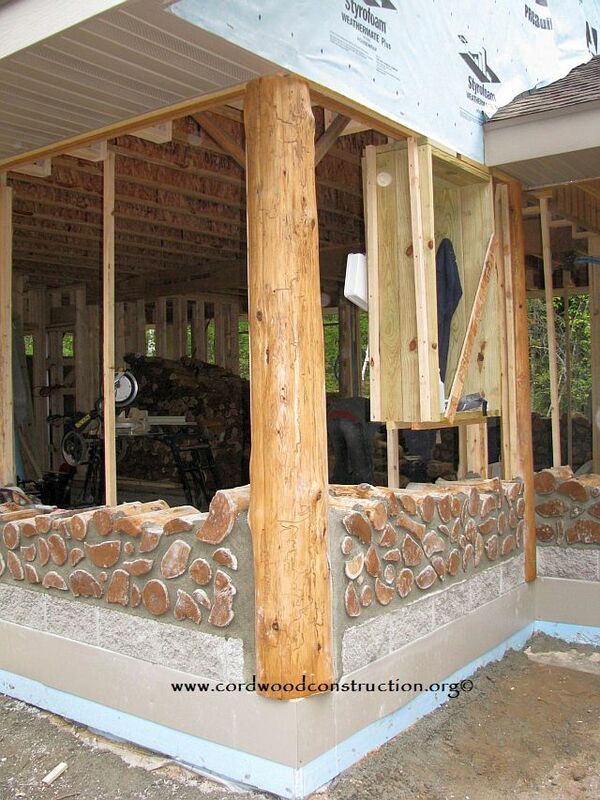 The cordwood masonry was finished by late October and the inside work commenced. 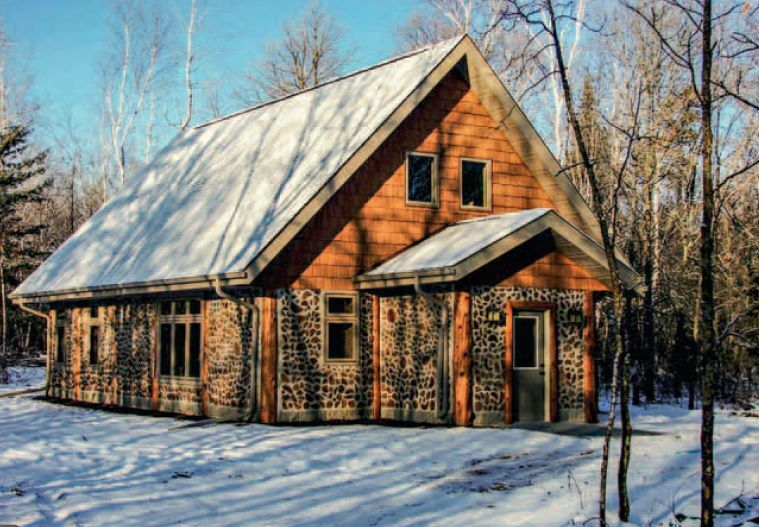 The entire cordwood infill was accomplished in less than six weeks. One of the highlights of this project was meeting and teaching the cordwood mortaring group which had been assembled for this task. The crew was paid a good wage and learned valuable masonry and construction skills in the process. They were enthusiastic and learned quickly. As the project went along, some of the guys started talking about building an Ojibwa Ceremonial Lodge and personal homes, using the abundant Tamarack on the edges of the surrounding wild rice lakes. One of the many side benefits of being involved in this project was receiving gifts of hand harvested and processed wild rice. Even though the project was open to women applicants, there were no takers. Becky ended up being the only woman on the crew and enjoyed working with the guys. Bill and Robert were instrumental in making some of the artistic Ojibwa motifs in the White Earth Home. 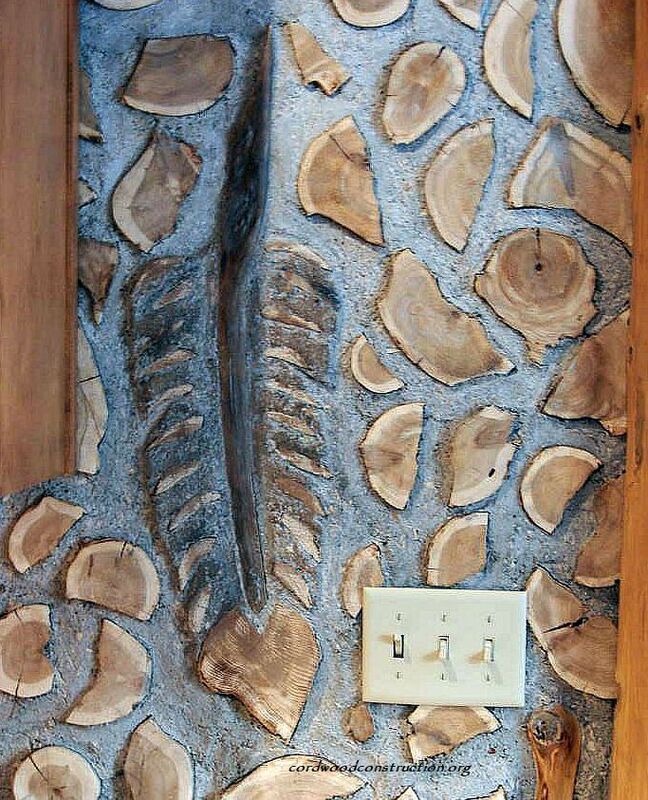 The owner of the home was a member of the Bear Clan, so Bill decided he would put a bear paw, a feather, the Medicine Wheel and shelves in the cordwood wall. They became the focal points of the house. We visited the home a year after completion to do any weatherizing that might be required We applied Permachinktm around a few log ends that had loosened and stuffed a few round log ends that had checked with white fiberglass. This well constructed home is easy to heat and blends beautifully into the surrounding woodland. The home has caused quite a stir in the surrounding area, and there are plans for building a commercial law office, a ceremonial lodge and more cordwood homes. We are proud of our involvement, and grateful for the friendships made, but we are also thankful to the tribal members who welcomed us and provided insight and assistance in making this home come to fruition. Being involved in a project of this magnitude was certainly a peak experience for us. (Below) Note the feather (left) and the Bear Paw (right) on either side of the door. 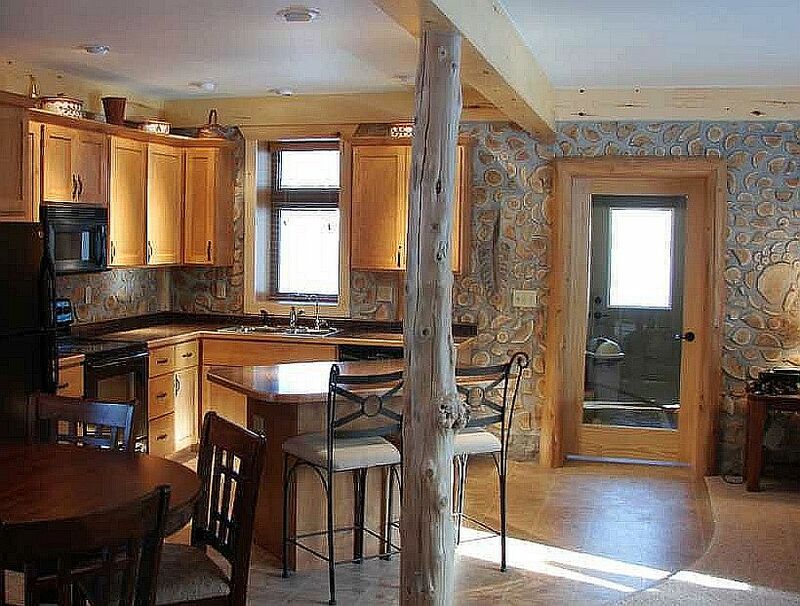 Winter or summer, the White Earth Cordwood home is comfortable and inviting to family and friends.